Earth Day: I know, I am a tad behind on my blogging:) I just wanted this picture for our future generations! We Planted a globe willow tree! I am so excited to watch it grow throughout the years. We also decided it was time that it was time we get a recycling center. So I purchased a Tupperware from the DI for 1 dollar and this is what it became. We also have an old trash can that we throw our paper in. We are taking simple steps to make our Earth a cleaner, more beautiful place! 7 Years: Dan and I celebrated by going to Salt Lake for 24 hours! Just the two of us! We ate at my favorite...Jason's Deli, watched the Avengers, slept in till 8:30, ate breakfast at The Little America Cafe, and went shopping at the beautiful City Creek Mall...it was the perfect weekend! 1 year: Sophie Anne turned 1! Wow....all I can say is time sure does go fast when your having fun! Sadly, I did not take nearly enough pictures of her on her special day:( She really enjoyed her Strawberry Birthday Cake, she even started blowing kisses! The day after her birthday, we took Sophie to her favorite place, the playground at City Creek Mall. As soon as we got there she started waving bye, mom! Come get me latter! I just love that girl so much! She is a happy, smart, and energetic girl! She independent and can be stubborn:) She loves to play, read, dance, listen to music, play with Chance, and help Grandpa in his garden! Mother's Day: Can I just say that I love being a mom? Being a mom has filled up the empty places in my heart and made it whole. Being a mom has helped me to find joy in the very simplest of moments including watching an ant pass by, and or cotton in the air. I just love watching that girl grow and learn each day! 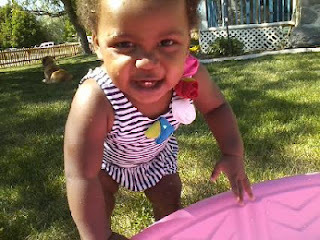 I am so thankful that Heavenly Father blessed me with such a beautiful daughter, it is truly a privilege to be her mom. A sweet surprise from a sweet hubby. A warm, Summery Spring: This Spring has been so lovely! We got Sophie a kiddie pool, swimsuit, and sunglasses as part of her Birthday gift and she has enjoyed it almost everyday for the past two weeks! 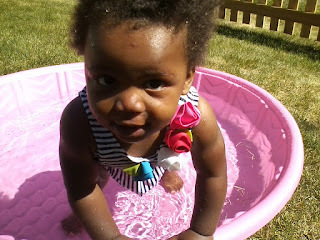 I am kind of missing the rain...but when I see this cute girl in her pool, it just makes my heart so happy! We have just been having, long, happy, sunny, and oh so fulfilling days! Life doesn't get much better than this...yeah right! That is what I thought 7 years ago and it did! Here's to falling asleep while waiting for your food! You're the best mom ever Emily! I'm so happy that you've gotten the opportunity to be one, Sophie is very very lucky.